Does your flat roof leak? Are you tired of putting up buckets every time it rains? Did roof leaks destroy the your ceilings, walls and carpets? You can put an end to your roof leak headaches by installing IB Flat Roof – a true lifetime flat roofing material, designed for commercial roofing application and brougth to residential flat roof market with Industry’s Best Life Time Warranty! Flat roofing is a very specialized niche in roofing market, and most roofers have very limited experience and knowledge about flat roofs. Most roofers who attempt to install a flat roof (namely rubber roofs as they are seemingly easy to install), fail miserably, and their roofs usually leak soon after installation. We specialize in installation and repair of IB PVC roofing systems – the only true lifetime flat roof, featuring hot air welded seams – once you weld a PVC roof seam, it is never coming apart. All flashing and overlaps on a PVC roof are fusion welded using special hot-air welding equipment, and the whole roof uses no glues or adhesives to keep the roof watertight. For us, flat roofing is a specialty (as well as metal roofing) – flat roofing is all that we do! Flat roofs are notorious for leaks and many home owners and businesses have constant problems with flat roofs, and trying to repair them, to only have yet more roof leaks just few weeks or months later. Flat roof leaks are caused by the nature of flat roof construction – water pools in some spots and often has nowhere to drain. Any roof penetration is a nightmare for roofing contractors, as trying to properly flash a skylight, HVAC curb or a chimney can be very tedious. Most flat roofing contractors use outdated and often obsolete roofing materials such as Built-up tar and gravel roofing. Many will resort to using cheaper and easier-to-install rubber roofs. All of these older roofing materials have common flaw – the fact that they use some kind of adhesive to glue the overlaps in membrane, and once the adhesive begins to fail, roof leaks start popping up all over the place. IB Roofs is a roofing materials manufacturer that specializes in PVC roofing technology, that was originally imported from Europe in the late 1970’s. Original IB roofs installed starting back in 1979 are still 100 percent leaks free. Since then, IB did not change their PVC roof formulation and today, you get the same great quality as the original IB PVC roofs. Benefits of IB PVC roof system include polyester reinforced scrim which prevent the membrane from tearing, and equal thickness top and bottom ply over the scrim. Top ply of IB PVC roof is usually white and includes the UV stabilizers to prevent the membrane from being damaged by the sun over its service life, and keep the roof weldable. Even now – 30 years after original IB roofs were installed, they are still flexible and you can weld a new patch to it in case there is a roof leak. As you can see in the video above, once you weld a seam on a PVC roof, it is permanently fused to the underlaying sheet of membrane, eliminating any roof leaks. IB Roof is a complete flat roofing system. As an IB Certified Roofing Contractor, we have full access to a wide range of roof flashing accessories, such as Inside and Outside corners, Pipe flashing ranging in width from 1/4″ to over 20 inches, PVC coated flashing metal such as drip edge, termination bars and PVC clad flat stock (for custom metal fabrication). 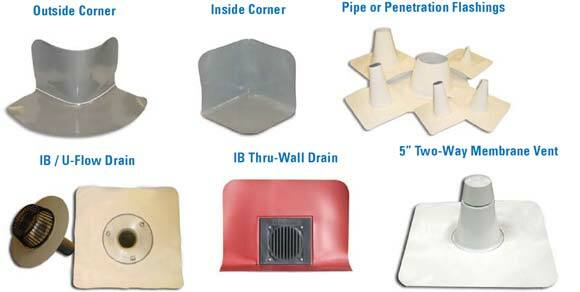 We can also have IB Roof Systems custom manufacture specialty flashing components such as commercial roof drains with PVC flange, Thru-wall scuppers, Roof Deck and Membrane vents, etc. All IB roof flashings are either made from IB PVC material or have a factory installed PVC flange, which allows us as a contractor to seamlessly integrate and flash any type of roof penetration and detail, by simply welding the flashing or accessory to the roof. This greatly speeds up the installation process and minimizes installation errors by roof mechanics. Besides the regular flat roofing materials, IB Roof Systems has developed flat roofs for special use, such as walkable roof decks / patios / balconies, where there is constant foot traffic and any other flat roofing material would immediately loose its warranty. This great product is called IB Deck Shield, and it is a special IB PVC membrane, with a slip resistant surface and beautiful pebbles pattern that imitates pool decks. IB Deck Shield is 100% compatible with other IB roofing membranes – the only difference is the surface and the installation method where the waterproofing membrane is fully adhered to the DensDeck moisture resistant substrate, for exceptional durability and puncture resistance. If you own a restaurant with a flat roof, you probably had many problems with grease and fats dripping from exhaust fans onto your roof and causing membrane breakdown, adhesive failures, etc. In the industrial sector, roof can be exposed different chemicals and gases, which will eat through the roof membrane, causing leaks and making it impossible to repair. IB Chemguard is a special membrane created by IB Roof Systems to be chemically resistant, and able to withstand exposure to all animal fats, petroleum based products, and other industrial chemicals. IB combined their PVC roofing materials with DuPont Elvaloy for chemical resistance. IB ChemGuard comes in commercial grade 80-mil thickness (25 years commercial warranty) and 50-mil thickness (15 years warranty) more suitable for restaurants. IB Chemguard also has a complete line of accessories with Elvaloy added to the formulation, so that entire roof is chemically resistant. Other than having Elvaloy, IB Chemguard is identical to other IB roofing membranes, and is 100% compatible with PVC roofs. If your roof has only one specific area that needs to be chemically resistant, the rest of the roof can be regular IB Roofing membrane. As a sidenote, we will mention that all IB Roofing Materials have a lifetime manufacturer’s warranty for residential application, and 15-25 years commercial warranty. The only exception is the 10 years warranty for IB DeckShield, as it is by default, subjected to continuous foot traffic.